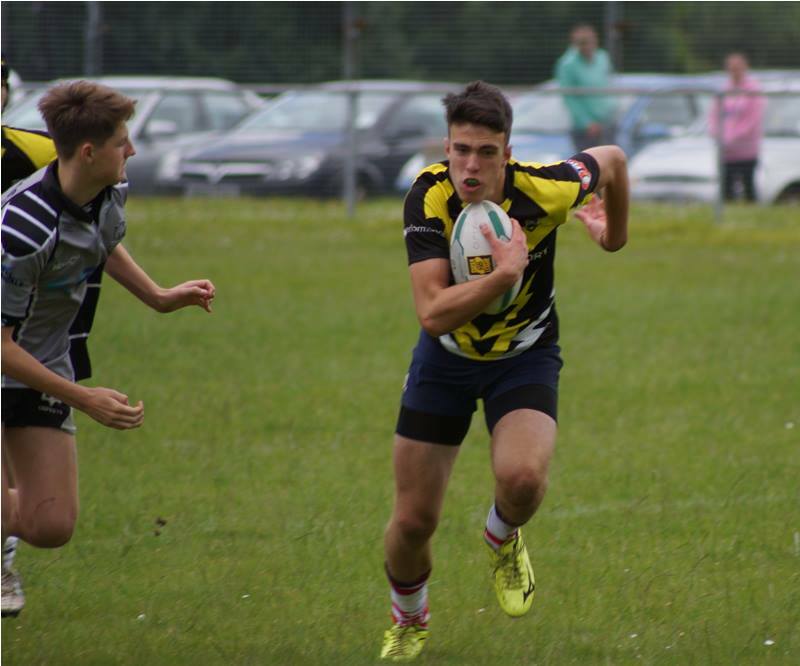 The weekend saw the U16’s do battle again once more with the Rhondda Outlaws. This is a team that we beat in their home fixture recently and also teamed up with in the tournament at the start of the season. On a boiling Saturday afternoon everything started right for the Sonics who opened the scoring with a cheeky move that saw the ball go up in the air and ending in a try. Then came the onslaught as the Outlaws refused to lose a second game to a depleted Sonics side. Just before half time the Sonics managed a sneaky kick in the dying seconds to give a glimmer of hope as a try was scored. A glimmer was all it was after the Outlaws opened the Sonics up through the second half, ending the game 10 – 70. Although it was a loss, a lot could be taken from the game. We had lost 5 experienced players, and gained 9 who had never played league before. With more games and training there is no doubt that the Sonics will only get better and stronger with time. Special mention to Joe Uren who stepped up to Captain the team whilst Connor Grant was off. Bristol Sonics will now begin their Conference League South campaign after Easter, delaying their first appearance in this year’s competition by three weeks. The Sonics were forced to request the postponement and rearrangement of fixtures with Nottingham Outlaws and Oxford Cavaliers due to a mix of injuries and unavailability leaving the squad threadbare. The Sonics will now start their season on Saturday April 11th, when 2014 Conference League South champions Valley Cougars visit Landseer Avenue. The Sonics continue to train on Monday nights at Landseer Avenue, home of Dings Crusaders RFC, in preparation for an extended campaign that runs until September. All potential new recruits and existing squad members are encouraged to make these sessions, or contact Dom Swann or Wes Rodgers as soon as possible to register their interest in being involved this season. Bristol Sonics Chairman Phil Cole said: “I’d like to put on record my thanks to the Rugby Football League, Nottingham Outlaws and Oxford Cabaliers for their understanding with regards to this matter. We pride ourselves in getting a competitive team out and it was with a heavy heart that myself and other members of the committee made the call to try and switch things around. Helpfully the RFL has built blank weekends for rearrangements into the schedule, so we hope to use these if possible. “The last 12 months have been particularly difficult for the Sonics, after many years of growth. Although there are many positives to be taken, including the amount of our junior academy graduates joining the Rugby League Academy at SGS College, we need to take steps to ensure that this translates itself into a stronger, more vibrant first team squad. We have not been helped by decisions out of our control, with regards to changes in Rugby League in the region. We have previously made clear our feelings about these decisions, and their possible affect on the Sonics, not just now but in the long term. While we cannot blame our problems on these decisions, it is very obvious that they have not helped. Bristol Sonics are laying on an end-of-season party, barbecue and presentation ceremony for the club’s junior players this Saturday, August 10. The event, which is free for all Under 14 and Under 16 players, and their families, will take place following the first team’s final home Conference League South fixture of the season, against Nottingham Outlaws, at Clifton RFC. Players and parents are encouraged to turn up early to watch the club’s senior stars in action. Their game against Nottingham kicks off at 2.30pm. The Junior party, barbecue and presentation will start around 4.15pm. Before the end of the summer holidays, the Sonics are also putting on two free Rugby League summer camps for players aged between 11 and 16 years old (under 12s-upwards). These will take place at Clifton RFC on Tuesday 13th August and Tuesday 20th August (9.30am for a 10am start). The camps will finish around 3pm in the afternoon and will comprise a mix of team-building exercises, core Rugby League skills and competitive games. There will be a number of coaches present, including Sonics’ first team players. All are Level-2 qualified and CRB checked. Players don’t need to book their place. If you want to attend, just turn up at Clifton in time for the start of each camp. Bristol Sonics’ juniors will play their first matches of the season this Sunday (9 June), as they travel to take on Welsh side Caerphilly at Virginia Park. Both under 14 and under 16 teams will be in action for the first time this year, with the first match kicking off at 11am. Players and parents, who will be required where possible to drive players over to Wales, are asked to meet at Dings Crusaders RFC in Lockleaze, Bristol – the current location for ‘Sonic Youth’ training – at 9am. Alternatively, parents and players can meet the rest of the squad at Virginia Park at 10.15am, in time to get changed and warm-up. Players must be registered with the club and the RFL to play, with forms signed by a parent or guardian. Those who have yet to register will be able to do so on the day.